The Right to Light in the UK is based on the Ancient Lights law and is a common law matter. Due to the complexity of Right to Light assessment methods, local Planning Authorities do not get involved in Right to Light matters. Instead, the planning system uses BRE sunlight and daylight calculations to assess impact of proposed developments and protect levels of light available to existing properties. Confused? Let’s look at it in more detail. The idea of protecting ‘right to light’ originates from ancient times and it was established in common law as Right to Light. The purpose of this law is to protect certain level of daylight available to windows in existing buildings. The law, as it currently stands, is very clear in terms of determining whether a window is protected under the right. However, certain ambiguities exist when it comes to establishing how much of the light is actually protected. Most planning departments will attempt to protect the light available to properties potentially affected by a proposed development by drawing a 45 degree line from the centre of the neighbouring buildings’ windows. It is then assumed that as long as the new development is localised below the 45 degree line – any potential loss of light caused by the proposal should not be a concern. The 45 degree rule is often used to assess planning applications but it is not used in legal Right to Light cases (just to add more confusion). Court cases are based on much more robust Right to Light calculation methods which are very different from planning application assessments. Therefore, there are many building projects that managed to secure planning permission but have been later ruled illegal due to a Right to Light infringement. Generally accepted as the most appropriate way to measure light levels in Right to Light legal cases is the so called 50/50 rule. 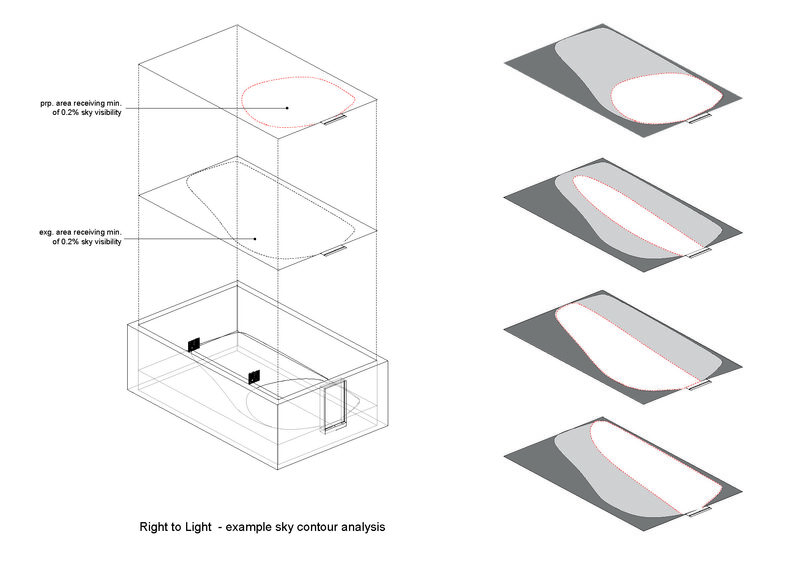 The rule involves calculating the percentage of a room’s area which can receive adequate light. The calculations are undertaken at a working plane of 850mm above the floor level. A point on the working plane is considered adequately lit if it can receive at least 0.2% of the total illumination received from the sky. An injury is generally deemed to be caused where the area of a room receiving light from at least 0.2% of the sky is reduced to less than 50% to 55%. Right to Light matters can cause a concern and bring a degree of uncertainty to a building project. We work with clients, property owners, developers and surveyors to identify a suitable design strategy and maximise the potential of development opportunities at early stages of the design process. Contact our team of architectural designers and we would be happy to help you.